Less than two weeks ago marked the passing of my Uncle Harry last year. I wasn't particularly close with him but it's still sad to think he's gone. Hardest hit was my Aunt Nancy (my youngest aunt and his wife). It's similar in concept to the one I made for my Aunt Diane after my Uncle Bill passed. I cut backing board (used for comic book storage) into the shape of a heart. 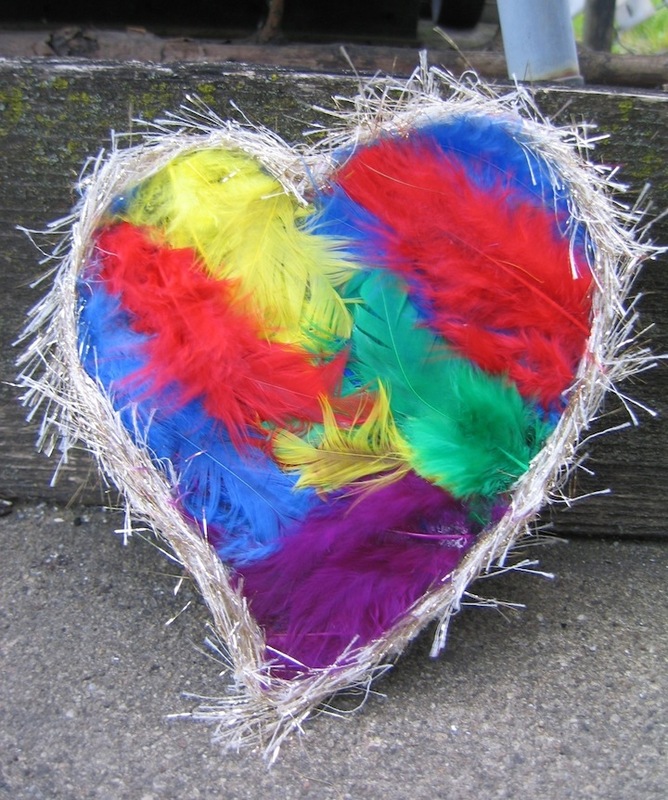 Colorful feathers were hot-glued to the front with sparkly fringe lining the edge. The back was lined with origami paper because I prefer the address-side to have a pattern so it's not so plain-looking. And since the concept of Mail Art is the artwork itself is the actual mail, once the stamps were placed on, this heart was sent as-is in the mailbox. My mom did question if it was safe to send the piece like that. That it may get damaged or lost. "That's the whole point of Mail Art," I replied. Arriving there is part of the process! Thankfully my aunt let me know the heart arrived that week safe and sound. Love was delivered to my Auntie Nancy!! So beautiful, Dean! My dad passed away in January, and I think I might have to do something special like this for my mom when the time comes. Seeing the feathers reminds me that the book I used to guide my retreat last month says that the Jesuit poet Gerard Manley Hopkins, "aged twenty-six … gave his mother a duck'r feather as a birthday present." He accompanied it with a letter in which he wrote, "But no one is ever so poor that he is not (without prejudice to the rest of the world) owner of the skies and start and everything wild that is to be found on the earth." You know so well that gifts don't need to be bought, and cards don't need to be bought. What you create is so meaningful. I'm sorry for your loss. I think your mom would appreciate a similar gift. Thank you for the book excerpt! Very interesting. I felt the feathers would be reminiscent of something airy and angelic and appropriate given the piece's intention. Plus I wanted to use material I've never worked with before instead of repeating myself. I appreciate you both for commenting on this! Dean, I still have your mail art you sent me...so special. Really like this one you sent your Aunt. You have a great eye for colour! I'm happy to hear you still have the Mail Art I sent you!